What are your hobbies? Yeah, I know. I can almost hear the groans, “Who has time for a hobby? 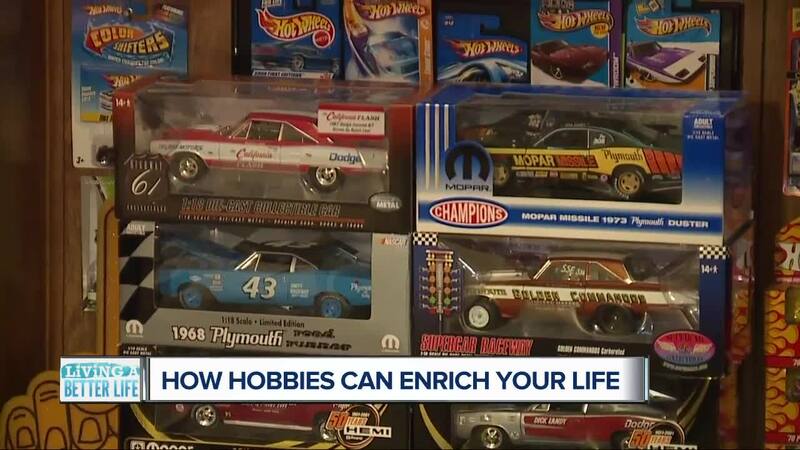 !” But whether it’s arts and crafts or collecting classic cars you might see in the Dream Cruise, many experts say hobbies can be beneficial. “Just a few cars here,” said Marc Rozman of Royal Oak as he walked into his basement full of more than 3,000 miniature cars. It all started when he was a teen putting model cars together while he was sick with acute appendicitis. "And then that led into doing custom models and then later on painting bikes and then painting cars and then working at the dealership and then Chrysler. It's been cars in my blood and my life all along,” said Rozman. His “brag book” shows his pride and joy – the ’69 Dodge Charger he rebuilt from the inside out. "I go out there [into my garage] hours at a time and just put the radio on and relax and hang out,” he said. “[I] get out the old the microfiber towel and just wipe the car down. To me it's kind of relaxing. Whatever happened that day, I can go out there, and it's just me and the car a little bit of polish, and it just all goes away." In addition to relaxation, he says going to all the car shows keep him social – and the mechanical aspect of his hobby helps keep his mind sharp. "Just like our bodies have muscles, we think of our brain and mind as a muscle,” said Dr. Steven Huprich – Professor of Psychology at the University of Detroit Mercy. Dr. Huprich said the mental and social benefits you get from hobbies are significant. And he explained that hobbies can also boost your mood and make you feel more energized. "[It’s] something that stimulates the mind, stimulates the brain, again just activates people in ways that gets them out of a complacent lifestyle or a place of being so sedentary,” he said. And according to author Jaime Kurtz, Ph. D. in the journal Psychology Today, hobbies can help you do everything from structuring your time better… to making you feel more inspired… to even helping you cope with stress. As Marc Rozman has learned – it’s all fun to him. Doctor Huprich said hobbies can feed people’s need to feel capable and confident – like learning a language or mastering an instrument -- or they can feed your relational needs of being part of a group and enjoying the company of others – like community theater or rec sports. And, of course, some combine both! So, carve out a little time to do what you love!